A newly discovered Apple patent suggests that Light Peak or a variation of the technology may be making an appearance in future Apple products. 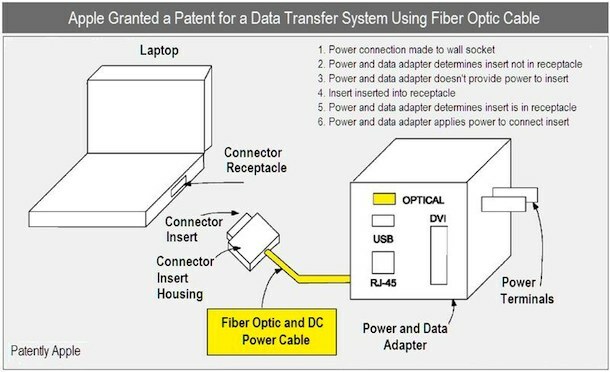 The patent describes a “Power and Data Adapter” that has a standard DC power cable with fiber optics included in the same cord, creating a single connector that would replace existing MagSafe adapters. The new adapter would have the ability to charge a device while transferring data at a very high rate of speed, the technology would clearly benefit Apple’s portable hardware, including the MacBook lineup, iPad, and iPhone. The patent was discovered by PatentlyApple who says “the new I/O promises us a means of rapidly recharging our mobile devices while wildly-accelerating our data transfers.” Whether or not the fiber optic portion of this patent is actually Light Peak or an Apple crafted technology that is just similar in functionality is not known. The patent also shows the possibility of MagSafe style power adapters coming to Apple portable devices like the iPad, iPhone, and iPod touch, which would be a great addition to the portable hardware. PatentlyApple is on a bit of a roll lately, earlier in the week they uncovered a patent for a Macbook Tablet that features a sliding screen that transforms a standard laptop into an iPad like device. Light Peak would be really great for data transfer but I’m almost more excited about MagSafe on the iPhone/iPad just from a practical standpoint.